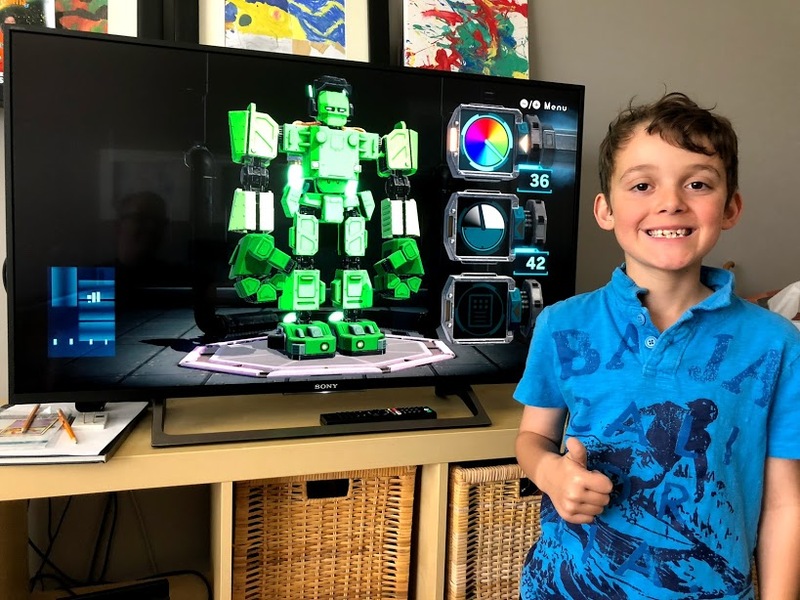 Last year, when Zacharie came back from a Disneyland with his grandparents, the thing he couldn’t stop talking about most was how he was now “a real Jedi.” He went to the Jedi Training Academy at Disneyland each of the 3 days he was at the park. He fought Darth Maul, and Darth Vader and brought home a lightsaber for his brother as a gift. “I’m a real Jedi, Daddy” was all he could keep repeating. 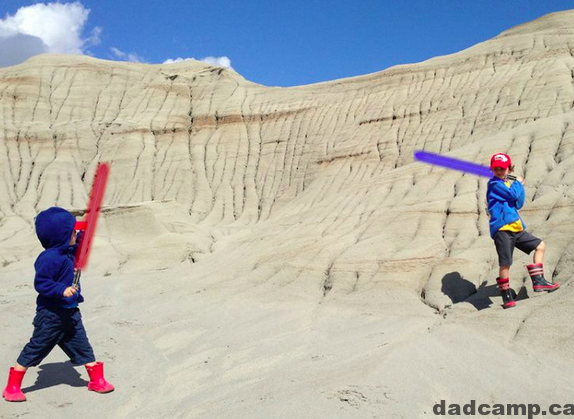 A few months later, we took what is to become a Father’s Day tradition – a weekend of camping, just the guys, at Dinosaur Provincial Park. The park is in the badlands of Alberta, so named because, well, the land is bad. You can’t really grow anything on this sandstone. It is dry, arid, and doesn’t do well with water. It’s terrible land, really. But while we were climbing around the hoodoos, the boys started to remark how the landscape looked like Tattooine, the home planet of Luke Skywalker they had seen in the Star Wars movies, and at the Star Wars: Identities exhibition in Edmonton over spring break. I told the boys to pose for some photos and Zacharie immediately announced, “Star Wars pose!” and mock held a lightsaber in his hand. Charlie, the ever imitating younger brother, immediately copied him. This would be the beginning of many mock lightsaber battles they would have over the course of the trip. When I was flipping back through the photos, I saw the poses and wondered if it would be possible to add actual lightsabers to their poses. When we went to Mexico for spring break this year, I purposely asked the boys to do Star Wars poses again to try and mix them in again. It was easier than I thought. 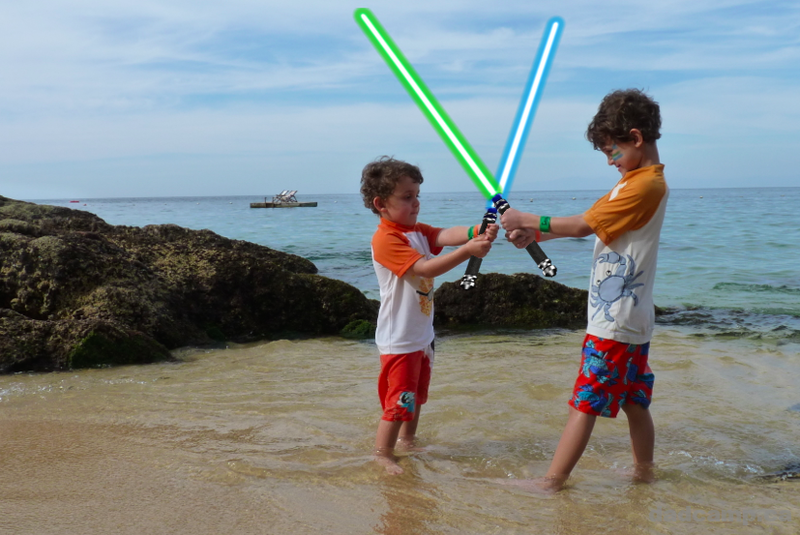 Here’s how to photoshop lightsabers in to the photos of my kids. I searched the web for some images of lightsabers first off this one from Think Geek is good, so is this one I found on Photobucket. If you’re good with Photoshop, and have the program, open it up. If you don’t have Photoshop, there is a free, browser-based alternative called Pixlr. This is what I used to edit the images. First you’ll want to add the glow to the lightsaber. Use your loop tool to slice the handle from the lightsaber blade and paste it into a new layer. Then add the glow to just the blade layer using the Adjustment > Hue & Saturation tool. Lightsabers burn white hot in the middle, and then glow different colours on the outside. So just slide your hue and saturation until you get one that you like. Paste the layers together to reattach the handle and then copy the lightsaber into a new layer on the photo you want to work with. 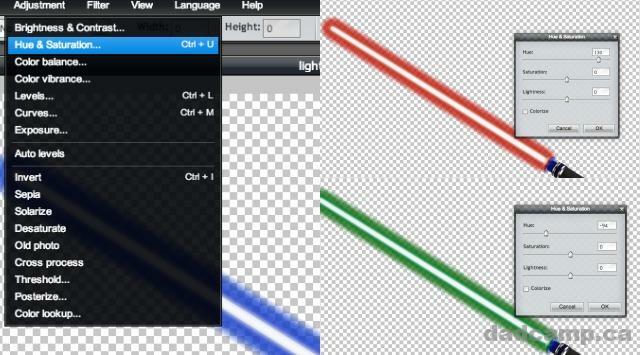 Align the lightsaber image to the appropriate size and angle of the hand of your photo by using the Edit > Free Transform tool. 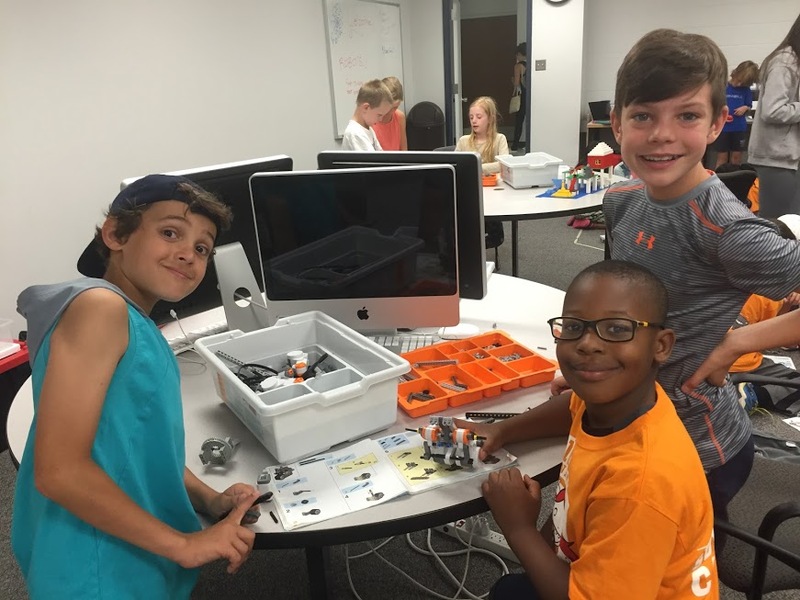 When you drop it into the image, it will be a layer on top of your child’s hand. You can then erase the part of the image that would be in their hand, leaving some handle out the bottom so it looks big and realistic. Now, save it out. And do it again. I absolutely love these images of my sons playing and will now make it a regular occurrence when we are out adventuring across Alberta. 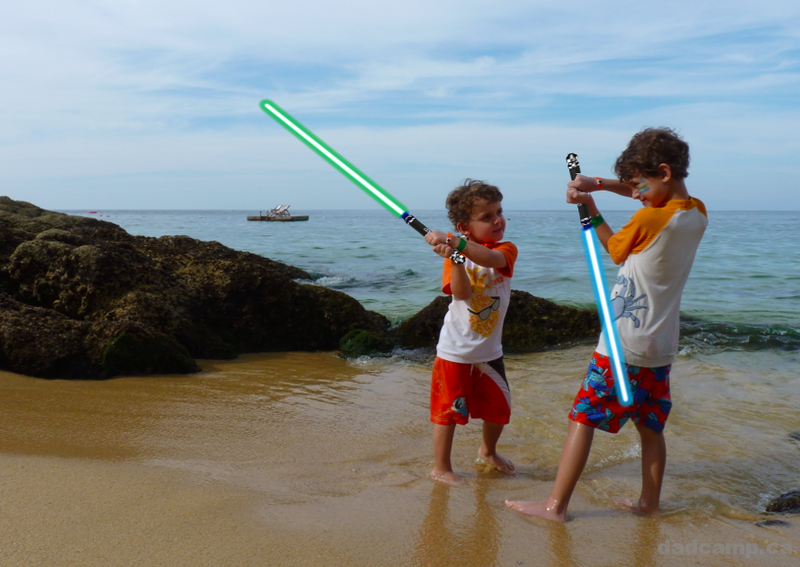 I’d love it if you would drop some links in the comments of any photos you’ve mocked up with lightsabering battles between your kids. Feel free to share this image on Pinterest to help other people find these tips! 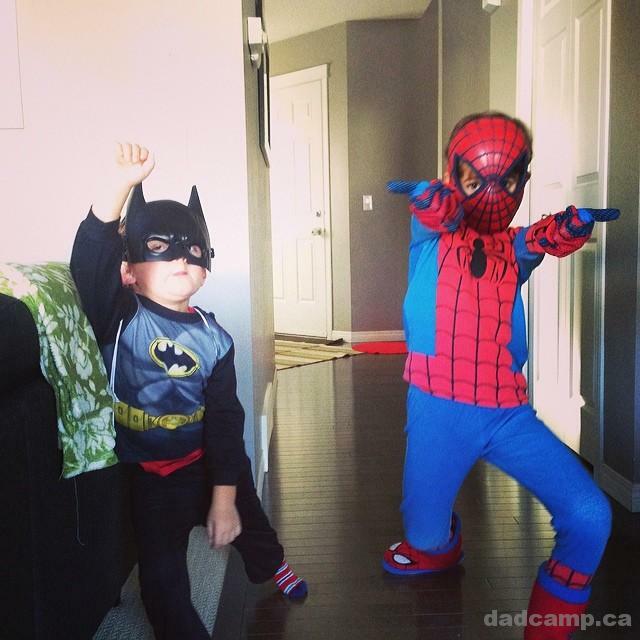 Love this idea…I am going to have to try it now or I may be nominated for worst dad ever! Thx for sharing.